Give the gift of flexibility! 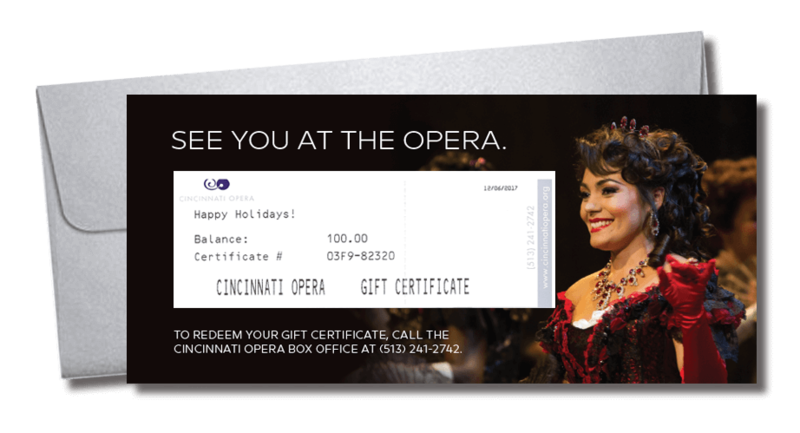 Cincinnati Opera offers gift certificates in any dollar amount, and can be applied to subscriptions or single tickets. Buy one for the opera-lover in your life, or give an opera newcomer a thrilling experience to remember. Gift certificates can be redeemed for tickets to any Cincinnati Opera Summer Festival performance. They are good for two (2) years from the date of purchase. Flexible dollar amount allows gift certificates to be customized for your specific needs. Gift certificates can be mailed to the recipient of your choice. Simply let our customer service team know what you’d prefer. Gift certificates are redeemable over the phone, in person, or online. Order now by clicking below, or call us at (513) 241-2742.